At Bob's Watches, your trust is very important to us. 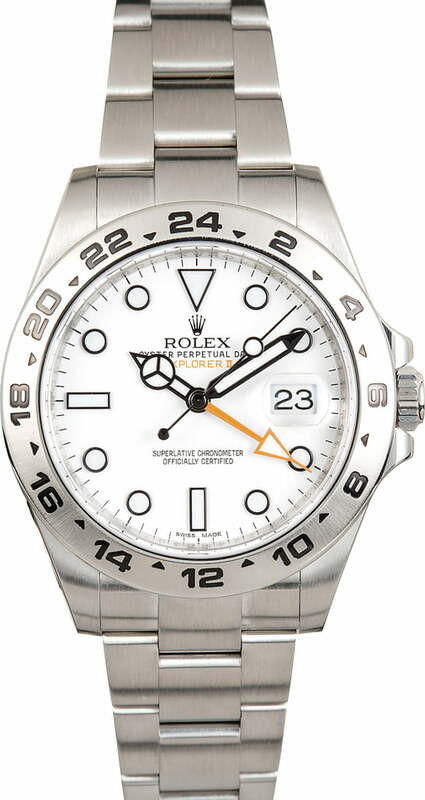 We believe that buying a pre-owned Rolex watch online should be simple, honest, and straightforward. To that end, we guarantee that every Rolex watch on our site is 100% authentic, comprised entirely of Rolex parts. 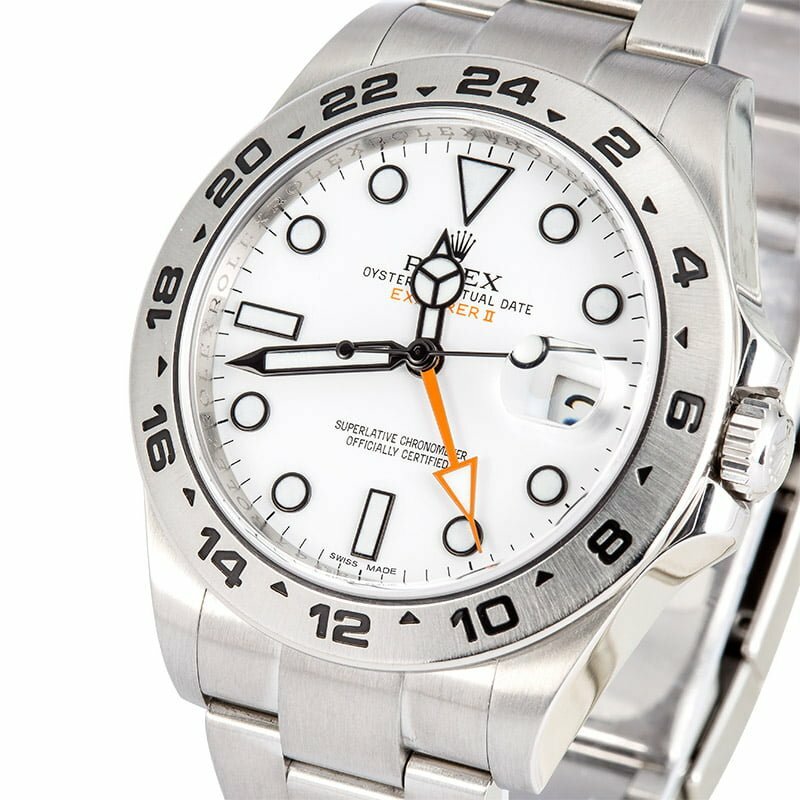 Our mission is to be the leading trusted online source for selling and buying authentic pre-owned Rolex watches. We stand behind this authenticity guarantee with a full money back refund on any watch not found to be completely genuine. Comments: This men's used Rolex Explorer II comes with Bob's 3-day satisfaction guarantee and one year warranty. Temporary Master photos. All side views are of actual watch and magnify 10x. The Explorer received a modern upgrade in 2011 with the release of ref. 216570. Similar to many newer model Rolexes, the case, bezel, and bracelet are crafted from the brand's patented 904L grade Oystersteel and the dial is now topped with larger hour markers and wider hands. Improved luminous material ensures a bright, even glow for an easy reading in most environments. The ref. 216570 also displays a bold orange dedicated arrow hand on the dial, which appears to be a nod towards the inaugural model that debuted 40 years ago in 1971. Also known as the "Polar Explorer", the ref. 216570 is characterized by a luminous display in stark, black surrounds and is highly sought-after by avid pre-owned Rolex collectors. *All Pre-Owned Rolex watches are guaranteed to be 100% genuine and certified authentic. All watches are shipped to fit the average size wrist (7 1/4" - 7 1/2" for men and 6 1/4" - 6 1/2" for women). Additional links can be purchased if needed. In a world of black faced sports watches I love the polar white face more than I ever thought I would. I spent almost a week using it as a true tool sports watch. From work with dress shirts to home shoveling and cross country skiing in heavy snow and as well as alpine all day yesterday. Very comfortable on my 7.5 inch wrist. Very easy to read, and not crowed. Time about +1 minute a day. Can't wait until summer for hiking and exploring. Very happy with the whole process which was easy, efficient and speedy. My Polar came in Excellent condition! Very very pleased. Thanks for a wonderful deal! This was my first experience with Bob's watches and overall the experience was excellent. I purchased the watch late morning on a Monday and the watch was at my doorstep in NY the next day by 11. The watch a Rolex Explorer II Polar dial was exactly as promised in excellent condition. If the watch had been worn previously I couldn't tell. Bob's also seemed to have the best inventory of this particular watch as well as price. I chose the Explorer II for it's bold looks, and because it's less worn by people compared to Submariner. Very unique and smart looking watch. I believe they are trustworthy. Their products are exceptional and match their descriptions. Smooth and fast transaction, love the watch and saved $1800 over new on a watch less than a year old! This was the most seamless and transparent buying experience. I purchased the watch on a Monday night and received it on Wednesday morning. I cannot be more pleased with both the purchasing process and the outcome. Excellent service,, Yes l will recommend y’all to others..